Whatever your feelings about being mean to strangers online, you can't deny that it gets results. 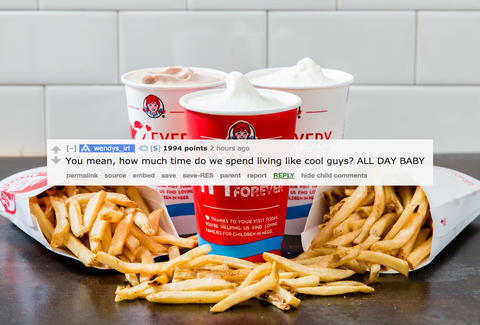 In just a short time, the team running Wendy's Twitter account has made the fast-food behemoth weirdly cool, and the account itself has earned a place in the Twitter hall of fame as the Charlie Chaplain of mean-spirited social media. We rarely get a glimpse of the people behind those cruel, cruel tweets, however, which is why it's exciting that team took to Reddit today for an AMA. It's not the most comprehensive look at what it's like to roast people for a living, but it's definitely entertaining. Comment from discussion We are the team behind the Wendy’s Twitter account. Ask Us Anything!. James Chrisman is a News Writer at Thrillist who refrains from roasting people because it's not very nice. Send news tips to news@thrillist.com and follow him on Twitter @james_chrisman2.